Concerning their new output "No Piercing, No Tattoo" our editor Nathalie Mohr asked T.Nikki of Peer Günt some questions. Hi, thank you for taking time doing this interview. 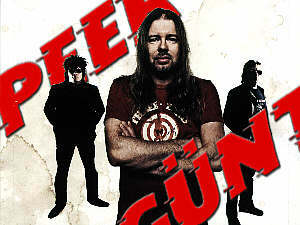 Would you mind to introduce the band to the people who don't know Peer Günt? 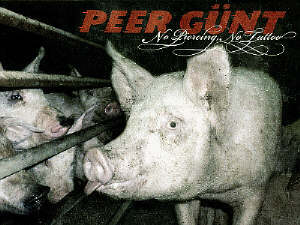 Peer Günt Is: I, T.Nikki , guitars and vocals. Twist Twist Erkinharju, drums and Tzöötz Kettula, bass and backing vocals. I founded the band in 1976. First PG was a punk band, but when skills got better band started to focus to the rhythm’n’blues direction. Late -70’s and early -80’s PG did create his own echo rock style. U2 did use same elements with a good success later on. Twist joined the band in -82 and Tzöötzs in -83, and we started to play blues stylish hard rock composed by me. 1984 we won Finnish Rock Champion Contest. 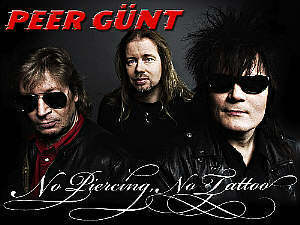 First album PEER GÜNT was recorded in spring 85, and the band was a hit in finnish rock festivals. Next albums BACKSEAT and GOOD GIRLS DON’T sold over the gold limit in Finland, and PG`s albums were released in Skandinavia and In Europe. 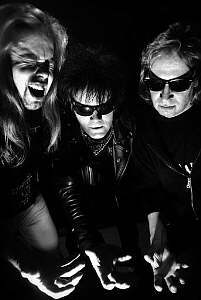 PG did make few tours in Skandinavia and in Sovjet Union in late -80’s, few gigs in England, Rosskilde festival and eleven days in Nothern Korea. After FIREWIRE, DON’T MESS WITH THE COUNTRYBOYS and SMALLTOWN MANIACS albums band quit performing for few years in 1995. In 2002 PG hit the road again, and released two singles Backdoor Man and Motorcycle Woman in 2004 and album NO PIERCING, NO TATTOO in february 2005. Well, one reason, why most people in Germany don't know you is the fact, that this album is the first for the last ten years. Don't you like doing studio albums or what's the reason for that? There was no reason to do any albums. We all have other interrests. Band was not active enough for the motivation that was needed. Do you see yourself more as a live band? Yes, we are absolutely live band. I make all music by myself at home and in studio we do final arrangements. I start with guitar riff, and begin to build a song from little pieces. Sometimes it can take me a long time before I’m satisfied. But composing songs to this album I found inside of me a real machineguncomposer. Some songs were ready so quicly that I was faster with the song than my wife was with the meal she was cooking, and she is a fast cook. Who came up with the idea of the bandname? Does it have a special meaning? I found the name in flowershops advertisement, there was a rose called Per Gynt. I had no idea what it ment, but it looked and sounded good. 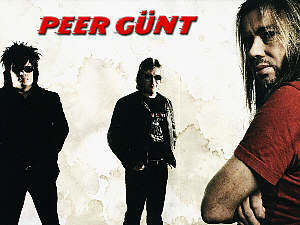 After reaching bands rehearsal place I had forgotten how to spell the name, so it become PEER GÜNT. This happened in 1976. After that I found Edward Griegs music, and we started to use his In The Hall Of The Mountain King as our intro in concerts. Let's come to the new album „No Piercing, No Tattoo“. One could think, the albumcover and the title are political. Which effect do you want to create with this? I don’t find it political. I just wanna make people to think how basic things in this maniac world are those which stay forever. Nowadays when you watch for example photos of modern bands it’s like watching an advertisement of some tattoo and piercing-shop. I know it’s part of the modern world and youth culture, but it makes me wonder how far a human being is ready to go, when he wants to be different than others. And when everyone tries to be different, it seems that they all look and sound the same. Seems that it matters more what you have on your skin than in your mind, somehow it doesn’t feel right. In "Wanna Shake Your Boomboom" appear some Western influences. Do you have a special relationship to Western or Country music? I think I have more relationship to old delta blues than to C’n’W Music. I listen a lot of old acoustic blues. How would you describe the album yourself? To me this the most personal album of all Peer Günt albums. Maybe it is part of getting older and seeing things in a dffierent way than ten years ago. You are in business for 22 years now. Did the band become your second family? Maybe ten years ago I felt so. But having a real family, you find out that three grown up men who have totally different opinion how this kind of band works, it is anything but not a second family. Didn't it become boring to do the same music for 22 years or do you have always new aims and challenges? Music is never boring, playing same songs is boring if you wanna make it boring. To me playing same song better and better every time is a challenge, and makes me enjoy that every time. You can’t carry on playing 22 years if you don’t love what you are playing. What's the best of your albums in your opinion? Too much happened thru these years. I can’t bring out any spesific anecdote. Those will be read in the book, that will come out in future. AC/DC, Nazareth, Slade, Aerosmith, Howling Wolf, Bloodhound Gang, Offspring, Ted Nugent,Johnny Winter, Rammstein, Hendrix, The Who, Motörhead...........this list will be endless. What can one except of you on stage? Do you strive to play in Germany in near future? Hard sweaty rock’n’roll. Don’t know about Germany, who knows. We will carry on as hard as we can to the end of the November and stop there. No attitude, I believe Internetmagazines will take over all markets in future.